After breakfast, we had a short devotional talk led by me. I spoke on the experiences that changed my life on mission trips to Nicaragua. The teens and adults prepared for the VBS later that night. They filled water balloons, built towers out of crates & boxes to be shot down by the water balloons, practiced the story of David & Goliath, etc. Western Christian (WCC) supplied us all with sunshine yellow T-shirts on our first day. Since we wear these T-shirts every night at VBS, they get a little stinky. So, Donna and Gail have been doing laundry each morning. The construction crew continued their work on tiling the bathroom. It is a large job and something they work at continuously from morning well into the evening. This work is different than what everyone else is doing. While others get to rome about meeting people and seeing God at work in the community, the construction crew is stuck in one place all day long. Their work is necessary and greatly appreciated. Fred Clements told me one of the benefits of such a work is spending long amounts of time with people you didn't know well before. He said that he would never think of these people in the same way again. I assume he meant that in a good way. Tammy and I ate lunch with Daryl and Kristin Steiner. They weren't sitting in a sycamore tree, but I did invite myself over to their house for lunch. This is their story. Daryl grew up in Prince Alberta, Canada the son of missionaries. The traveled around including Papua New Guinea and Ukraine. He moved to Little Rock where he met and married his wife Kristin. Daryl and Kristin both wanted to be in ministry. They prayed that God would lead them to the place He wanted them to be. Specifically, they prayed for a specific phrase to be used so they would know which offer to accept. Several opportunities came and passed, but none used that special phrase. One day, Kevin Vance came to offer Daryl's uncle a job at WCC. Kevin met Daryl over dinner at his uncle's house. That night Kevin told them that he "needed them to help plant a church". That was the phrase they were looking for, so they moved to Canada. After buying an 1100 square foot "fixer upper" house and spending a few months remodeling it just enough to be livable, they moved in. Three days later, kids from the neighborhood started showing up to his house. That night, the kids left crying because they thought the house was haunted. You see, prior to the remodeling, they found needles in the house and dog feces. The house was so bad that the neighbors thought it was haunted by people with AIDS and the kids believed it. Soon after, more and more kids started showing up to their house. They even started spending the night. All this was long before Daryl and Kristin met the kids parents. In some cases, they didn't meet the parents until a year or more later. Kids in the neighborhood saw their house as a safe place, a refuge. When kids needed to escape from home, they came to the Steiner house. The kids saw the house as their home away from home. In one case, the Steiners woke up one morning to find some neighborhood kids in their room waiting for them to wake up and fix them breakfast. In most cases, the kids have tried to steal and push boundaries. In all cases, they have been loved. The number of kids coming by started to increase. On Tuesday nights, they would invite WCC to help run "the party" at their house. The party consisted of 4 or 5 stations in their house and outside weather permitting. The WCC teens began working with the kids and maturing themselves. The initial 5 grew and eventually became 35 and it became apparent that God was working here. So, they took a big risk and moved the party to a neighborhood elementary school. God blessed that by increasing their number to the 50 or more that it is today. Along the way, they have been able to minister to a lot of children. One of those children was a 12 year old girl who asked to be baptized. She said she didn't want to end up in jail like her brother and didn't want to be a prostitute like her sister. Before going through with it, Daryl wanted seek her parent's permission. Happily, they gave it. That was a catalyst for several other kids wanting to be baptized. Some parents gladly gave their permission while clearly saying this church stuff wasn't for them. Others refused. The great thing about this was that a conversation was started with the parents. This conversation has led to Bible studies and attendance at small groups. A great beginning. This is the church planting Kevin Vance is working towards with the Steiners. This is why Kevin left the comfort of a job at WCC for the financial insecurity and eternal reward of helping the helpless. God is working in Regina Canada through these people. We need to pray for that work and find out how we can be apart of that. After lunch, we broke up into 4 groups. Each group spent a couple of hours on a service project benefiting the Regina community. Habitat for Humanity is the 8th largest builder of homes in the U.S. according to the Wall Street Journal. One of the ways they supplement donations is by running a discount store containing used appliances, paint, building materials, etc. Our job today was to dust the store. It sounds silly, but it is a necessary job that someone has to do to keep the store presentable. WCC has a relationship with Habitat for Humanity because of a former student in the high school. In order to have a house built, Habitat for Humanity requires that the family spend 300 hours in service on the house. 200 of those hours can be contributed by friends and family. WCC stepped in and helped organize the labor that would help meet the requirements so that student's family could move into a new home. Food pantries are hugely dependent on volunteer labor. People who came to the store would receive rations for 3 days once every 2 weeks. Moreover, some food was for sale at reduced prices. This money is funneled back into the food pantry. For our part, we sorted produce and canned goods. Some of the produce was bad and had to be thrown out. The canned goods were divided into palettes and categorized by food groups. One of the men that work there said that we did in 2 hours what it would have taken him 2 days to do. A near by soup kitchen feeds 300 people a day and provides a bed on the second floor for people to sleep. Our job was to clean the kitchen and dining room top to bottom. It wasn't bad to begin with, but we gave it a health scrubbing for good measure. The North Central Regina Community Association formed a community vegetable garden almost 4 years ago. Actually, its a series of gardens planted on open house lots owned by the city. Because the houses tend to be 2 story and narrow but long, the gardens tend to be long and narrow as well. As anyone knows who has ever had a garden, it is a lot of work. While everyone is glad to help with the harvest, getting people to help weed and maintain the garden is a constant challenge. Just ask the little red hen. We swooped in on one such garden and spent our time weeding. Soon after we started, people in the house next door came out. One by one, they trickled out and began to watch us. We went over and talked to them and struck up some good conversations. After a little while, one of the woman brought out a 5 gallon bucket of water (their house had no external water spigots). Bucket after bucket, we were able to water most of the plants in the garden one-by-one. Towards the end, one of the men started to help us weed. Hopefully, this will produce more than produce. Galon is hosting a seminar for people who live with addicts. It is very informal and is located in a near by Caribbean restaurant. Four woman attended and told stories that would break your heart. Addiction is a common problem that destroys entire communities. We're conducting two VBSs each night: one at a near by park on behalf of the Northwest Church of Christ and the other at Glen Elm Church of Christ. Each VBS has the same theme: David. Tonight's lesson was on David & Goliath. Each VBS had a good turnout: 67 at the park and 31 at Glen Elm. While the park is very safe during the day, at night, it is used by drug dealers and drug users. For example, last night, we found needles in the bushes. We're going to sweep the grounds thoroughly before VBS tomorrow night and take other necessary precautions like keeping kids out of the bushes and wearing covered shoes all the time. After the VBSs, most vans stopped off for a treat. 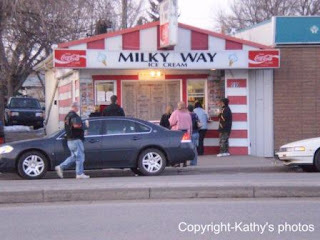 Some went to Milky Way, a local legend for selling home made soft serve ice cream (unlike DQ & McD who can't call their's "ice cream" because it starts from a powder). The lines were long, but worth the wait. Others went to Tim Horton for donuts. The locals rave about the coffee, but I've heard good things about the donuts too. Henry looks like a grandfather, but is the father of a 7, 9, and 11 year old. One of his kids, Aubrey, has half a heart and has had 11 surgeries including a heart transplant. Henry's wife had a difficult time dealing with these problems. She had a breakdown and ultimately died. Henry described how large a leap of faith it was to turn your young child over to the doctors. After turning all control over to the doctors, one is left with a feeling of helplessness. Despite all this, Aubrey was one of the happiest children at the VBS. So happy, in fact, some began to worry about over exertion. Henry, though, just sat nearby with a parent's joy of watching a happy child. Sarah is a woman in her early 20s with a first nation heritage. She returned to Regina to take care of her mother who couldn't take care of herself because of her addictions. Sarah was taken away from her mother when she was young and lived with another family. This second family became her true family by loving her unconditionally. A couple of years ago, her boyfriend beat her so badly that she was hospitalized and nearly died. Now, she is going to school to become work on auto bodies and dreams of traveling the world to see the 7 wonders. She is a sweet girl who has to take care of her mother, 3 or 4 younger siblings, along with an older sister and her 4 kids. I pray that she attends the addiction seminar and comes to know the transforming power of God. Audrey's parents "amazed with our faith and devotion"
A child asking "Can God be on my side?" People that made it seem like Christianity might be "cool"